This is for all the Funk/Soul and Hip Hop lovers. Very relaxing. 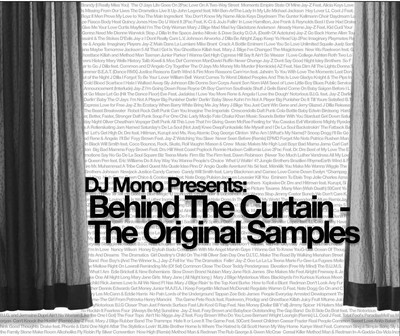 I stumbled upon DJ Monos Behind the Curtain Mix back in 2010 and since then it became a good friend on my playlist. The listener just needs to relax, sit back, and enjoy this ride back into time and sampled music history, enjoying 145 original songs mixed in a fluid and flawless mix. I also have good memories about the Mix. Behind the Curtain was definitely the soundtrack when I went for the Ninja Spin 2011 with Markus Reich to stay at Matthias flat in the heart of Paris together with Adam Kun. Good times. It was really hard to find the download. Seems like the internet forgets about things, too... Enjoy.